Greetings to those of you who have waited so patiently for this blog to get up and running! For my inaugural blog post, I thought I’d share one of my favorite Late Bloomer stories, which still amazes me to this day. With no more than a sixth-grade education, an aging Colonel Harland Sanders invested in his dream and became one of the most iconic figures of our time. I may not be a KFC eater (although that mystery gravy is quite tasty), but I am a fan of the man behind the chicken and his incredible story. 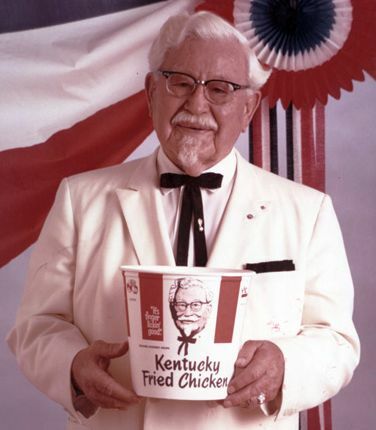 Colonel Sanders, like many Late Bloomers, had a whole slew of jobs as an adult, including being an insurance salesman, a steamboat pilot and a streetcar conductor. It wasn’t until he was 40 that he began preparing chicken on a regular basis for others. And it wasn’t until age 65 (after his business had failed) that he used $105 from his social security check to create the Kentucky Fried Chicken franchise! Today, almost 60 years later, KFC is still a powerhouse worldwide. According to the official KFC site, there are more than 15,000 restaurants in over 100 countries and territories. After doing a little research, I’ve discovered there is much said about this man (both good and bad); but regardless of his critics, his is an inspirational story about having a dream and the perseverance to make that dream a reality. Colonel Sanders was at an age when most people would have simply thrown in the towel, slowed down, or quietly faded into the sunset, which I’m sure many encouraged him to do; but Harland did no such thing. As the Colonel understood, we all have our own unique timelines. Obsessing and comparing ourselves with the young phenoms of the world is a waste of time. That energy is much better spent nurturing our goals. So, in those moments when you’re beating yourself up, because you feel like you’ve wasted your time and talents, try to remember that every experience contributes to the success that you are to become. And as long as you don’t give up, achieving your dream is possible. Take a cue from our dear friend, Harland. This entry was posted in Uncategorized and tagged Colonel Sanders, dreams, goals, Harland Sanders, Inspiration, Kentucky Fried Chicken, KFC, Late Bloomer, success stories late in life. Bookmark the permalink. ← Hello and Welcome, Everyone!